Stories in English | Moral Stories | A tribute to the great Bharatiya Samskruti. Shri Krishna paramaatma, who blessed Bhaarateeyas with Geeta-amrutam, is just learning to utter small words. The One who occupied Bhoomi-aakaashams with two feet, as Vaamana-murti, is just learning to walk. Day-by-day, to the aanandam of Nanda and Yashoda, Baala Krishna was growing-up. While Shri Krishna was playing, the dust on His body used to resemble Vibhuuti on Paramashiva’s body. The mauktikamaala (pearl garland) with which Yashoda tied His curly hair resembled half-moon on Chandrashekhara’s head. Kastura tilakam of BaalaKrishna looked like the third eye of Kaamaari. The big Neelamani on the ratnahaaram of Shri Krishna looked like Haalaahalam’s black mark on Garalakantha’s throat. The mauktikamaalas around His neck resembled sarpa-haaras of Naagabhuushana. Baala Krishna used to play many vichitra-kreedas with Gopabaalas. 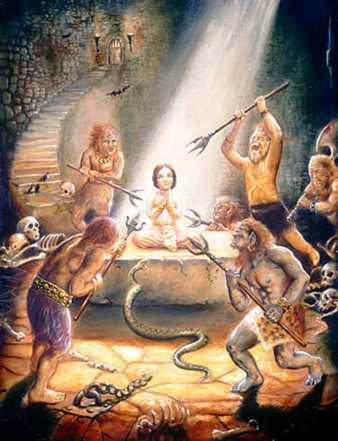 Gopikaas believed that the mischief of Krishna paramaatma was true! 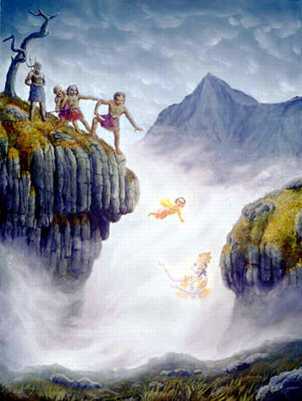 They did not realize that the mischievous deeds of Baala Krishna were nothing but great Mahopadeshams for them. Who can understand the actions of Yogeeshvareshvara, Shri Krishna, completely ? One of the Gopikaas who lost her patience by the mischief of the Lord, approached Yashoda and complained like this “O Yashoda! What should I tell about this naughty child of yours? The women in our house have no milk to give to their babies. They wanted to atleast feed the babies, who were crying with hunger, with Go-ksheeram. From no-where your child, Shri Krishna, came and released the calves near the cows. The calves drank-off milk from the cows, leaving nothing for the babies. The duhkham of mothers who were not able to feed their babies is un-describable. Is this Nyaayam? O Ambhojaakshi! Please tell us”. The pain and sorrow experienced by mothers who are not able to feed their babies is also experienced by the Gomaata (cow) who is not able to feed her calf. Hence Baala Krishna left the hungry calves near the cows. Through this story Shri Krishna Paramaatma wanted to teach us that we must be compassionate not only towards fellow humans but also towards pashu-pakshi-vrukshaas etc. Jagadguru Shri Krishna taught us the Dharma that we must consume only the milk left over after a cow feeds its calf (please see the story of Dileepa who followed this Dharma). It is really heartening to see that in the name of “modern technology”, even in our country where the Gomaatas are worshipped, cows are milked through machines without having any kind of concern for the feelings of cows towards their calves. Just because the animals cannot speak we are exploiting them, denying them their minimum rights of motherhood. “Modernization” should never be at the cost of Dharma. Long time ago, there used to be a Sanyaasi. He was a great Gnyaani. Many used to respect him and many used to come and get Divya-Upadeshams from him. He was a well known Aadhyaatmavetta. He had many shishyas. 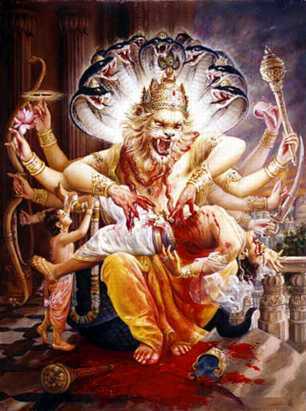 He did uddharana of many. 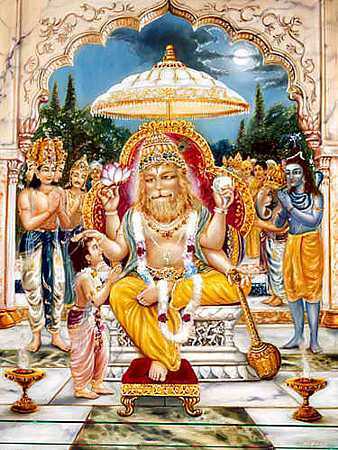 Even Kings and Mantris used to come to him, have his darshanam and get Gnyaanopadeshams from him. The Sanyaasi became very old. Since he was a Gyaani, he came to know soon he has to leave his Bhoutika Shariiram. Hence he was doing Bhagavat-naama-smaranam and waiting for Mrutyudevata. Knowing this, many many from all parts of the country came there to get the last darshanam of the Sanyaasi. True Bhaktas came to have Darshanam of the Sanyaasi and get some Upadesham if possible. However some came expecting to get some shakti or some materialistic benefit from the Sanyaasi. One of them was a Sampanna (rich fellow). He was a lobhi (miser), Kruuraatma, Muurkha. Hoping to get some more wealth he came to have the Darshanam of the Sanyaasi. 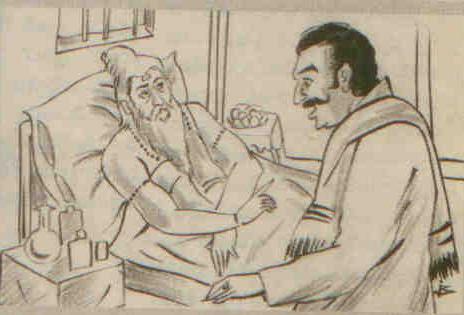 The Sanyaasi, who didnt want to meet anybody, seeing this Parama-lobhi, called him. As soon as the Sanyaasi called him, though many many were waiting, the Lobhi got Garvam. He looked at others with an expression like “see how great I am. The Sanyaasi called me only”. The Lobhi wanted to ask the Sanyaasi why he chose him only to come in. Repeatedly he kept on asking this. Then Sanyaasi replied “I and these people waiting outside, some or the other time, have chance to meet again in some Uurdhva-lokas. Whereas a Lobhi can never get sat-gati. So I can never meet you. Thus I wanted to do some Hitopadesham to you now only”. Long time ago, Bandar, which is in Aandhra Pradesh, was a small town. One day a person was walking on a street of Bandar. The style of his walk itself showed his honesty. After all only an honest person never needs to lower his head. This person saw something on the road and it stopped him. It was the cry of a young boy. The boy was sitting outside his house and crying. The person approched the boy asked him why he was crying. Seeing the Daya in his eyes, the boy told his story “Swaamy! My father died recently. We are three brothers and our Maata is there. I am the eldest brother. I searched a lot for a job, but I was not able to get one anywhere”. The person thought for a while; he wanted to help the young boy somehow. He said “come with me”. They both went to a Bank. The person talked to the Manager and the person requested the Manager to train the boy on some Bank related work. The boy learnt the work with great shraddha. One month was over and the person gave money to the boy from his own pocket. Similarly, the next month, the person only gave money to the boy. From the third month onward, since the boy had enough experience, the Bank itself recruited him and thus the young boy was able to stand on his own legs. The person was none other than “Dr. Bhogaraaju Pattaabhi Seetaaraamayya“. He was one of the freedom fighters and did great Desha-seva. 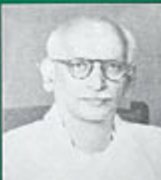 He was born on 24th November 1880 in Gundugolanu village, West Godavari District in Andhra Pradesh. Though Shri Seetaaraamayya could have just given the boy some money and consoled him, he didnt choose to do that. Instead he spent his valuable time, made the person learn to stand on his own legs and did true help to the poor family. May be this is why Panditas say “Samaya Daanam” is the greatest Daanam.